Apple, Google, or Spotify Music? I’ve tried all three of the big, subscription-based music streaming services, so I thought I’d share my experience with you. Since every member of my multi-age family shares an account in a home that uses Google Assistant, we are currently subscribed to Google Music. But is it the right one for you or your fam jam? I hope the matrix below helps you decide. Please let me know your thoughts in the comments below. When was the last time you saw a film, let alone a series, written by, directed by, and starring the same people? This used to be far more common in the days of low-budget auteur cinema, but almost unheard of in the mass scale production of most Hollywood-centric film and media. So, after completing the series, I fell into a bit of a YouTube rabbit hole of interviews with Marling and Batmanglij to find out how people can possibly co-create a complex Netflix series to this extent, especially as it interrupts my own assumption that writing is a solitary act. I’ve been learning a lot about collaboration from listening to them. But once we’re finished, it’s actually a great part, too. We really draw a line in the sand. Zal goes away and directs, and I go away and act. It’s actually really nice; how close we get in the writing, and then how we have to separate, then come back together again in the editing. It’s a beautiful process. You can view the complete interview below. It’s obvious to me that great storytellers even describe the process of creation as a compelling story in and of itself. Since I can remember having eyesight, I’ve loved comics and graphic novels. As a child, I used to consume them like my dogs do bacon. Although I read my share of novels, especially as a teen, it has always been the combination of imagery with words that has magnetized me to a stronger degree. Unsurprisingly, I find my own children, and particularly my 9-year-old son Jackson, also love getting lost in the world of pictures plus print. And it’s a good thing, too, because there’s never been a better time to love reading graphically illustrated stories on paper and tablet. There are so many more well-written stories which move beyond the serial crassness of comics I read as a kid such as Archies. A common thread in many of them tends to be the quest for identity and friendship in an ever-confusing world. If you’re looking for some beautiful, hilarious, and relatable books to get your high elementary/middle school child engaged in literature, check out some of the following titles that require violence to pry from the hands of my son. Awkward is an adorably illustrated manga title by Russian-born Canadian Svetlana Chmakova. 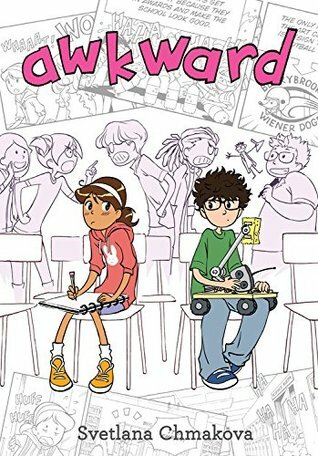 It centres around the experience of “Peppi”, a young girl who arrives at a new middle school fraught with archetypal characters and drama. It’s the first one my son read dozens of times, and the one I noticed him falling asleep with on top of his face. Any child that loves stories of not fitting in will love this series. I especially loved the way Chmakova deconstructs the process she went through in creating the characters, story, and illustrations at the back of the book. Quick, tell me about a graphic series you read as a kid which revolved around feminist girls that also represented the LGBTQ community! I’m waiting… A groundbreaking series which focusses on a group of misfits at camp, Lumberjanes is a hilarious and adventurous series with deep, underlying themes of equity and inclusivity. One of the coolest things I discovered from a parent’s perspective was that my son didn’t even realize the characters were girls due to their androgyny. I really think Lumberjanes has played a significant role in my young son being very comfortable with talking about gender diversity. 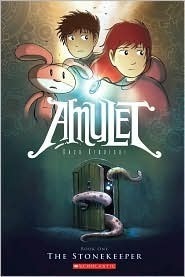 A well-known series for those who frequent Canadian school libraries, Amulet is a stunning tale of two siblings in a strange land who embark on a quest to save their mother. It is dark in just the right way for the junior reader. 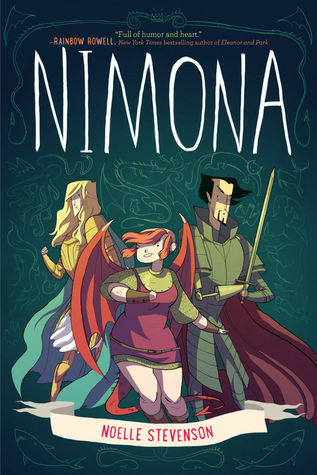 The debut graphic novel from one of Lumberjanes‘ authors, the wise and talented Noelle Stevenson, Nimona follows its title’s namesake and her friends on a mission to prove that their status as “villains” is based on ignorance and hegemony rather than truth. Stevenson is so deft in inviting the young reader into dealing with ambiguity and complexity, challenging common Western tropes and simple binaries. 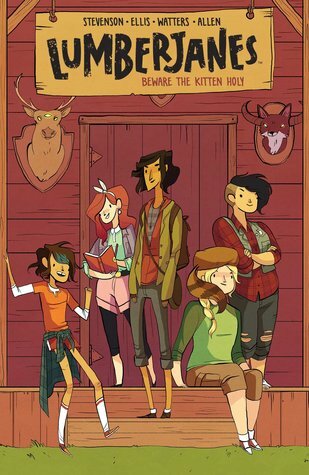 This book is a perfect companion for the Lumberjanes lover. 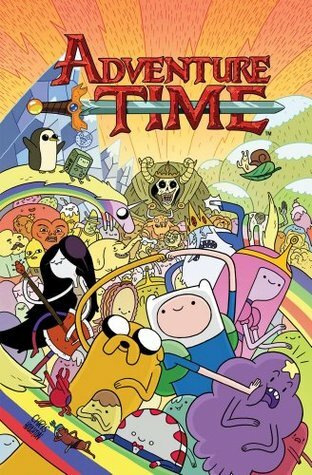 Every time I tell my son that it’s time to return either Bravest Warriors or Adventure Time to the library, he squeals like a baby whale in pain. He’s even tried to hide them from me, library fines be damned. When I ask him what these silly looking books adapted from their respective television shows are about, or why he loves them so much, he simply gives me a look like this: And I wouldn’t have it any other way. 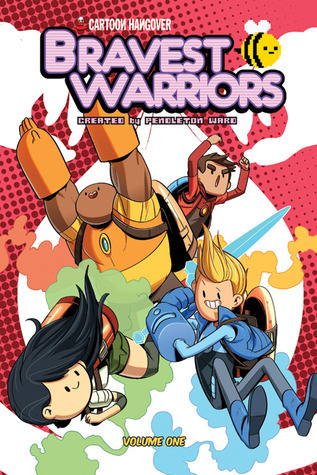 Do you know any kids that love comics and graphic novels? I’d love it if you recommended some more to my family in the comments below. In which cloud should I store my photos? There are so many cloud photo storage and syncing services now. What’s a person who wants to save, backup, sort, and enjoy their plethora of digital photos to do? I hope you find this matrix I started helpful. I am certainly not the authority on this topic, so please feel free to add your two or more cents in the comments of this post or directly onto the Google Doc. It’s called The Choreography of Presenting: The Seven Essential Abilities of Effective Presenters, by Kendall Zoller and Claudette Landry. If you are someone like me, who frequently stands in front of other adults to present ideas, persuade, or facilitate learning, I think you might find it enlightening, if not just plain useful. Zoller and Landry (Z&L) write pragmatically and simply about something we rarely consider in an explicit manner in education: How do you use your space, body, movement, speaking voice, and ability to read people to give better, more purposeful, less anxiety-driven presentations and facilitated sessions? They posit seven interrelated areas we all need to plan for and enact. This was my favourite section of the book, as I’m a card-carrying member of the Credibility is Everything Club. Z&L talk first about the two different voices we should use when speaking to our group: the approachable voice and the credible voice. The former has more fluctuation and melody. They suggest we use it to be invitational, encourage divergent thinking, and build trust in the group. The latter, credible voice, they say, has less audible modulation, and is best employed when you want to be definitive, or to move the group from one activity to another without uncertainty or doubt. I found it fascinating that sometimes we unintentionally create uncertainty, discomfort, and undermine our own credibility as facilitators and presenters by using too modulated a voice tone in moments when it is unnecessary. Z&L also write about the importance of strategic pauses, whether it’s through your spoken word, your body language, or a still hand gesture. By using intentional, pregnant pauses when speaking with the group, Z&L suggest we alert them to important moments where you’re asking for everyone to pay special attention or focus. Feet are parallel and hip-distance apart. Arms are perpendicular to the ground and relaxed, or intentionally parallel. Breathing comes calmly and deeply from your abdomen. Throughout the book, Z&L stress the impact that a presenter’s breathing has on session participants. According to them, by breathing heavy, fast, or not at all, one can actually illicit conflict and anxiety rather than maintain credibility. But all of this doesn’t even come close to what was my favourite part of their section on credibility. There is one technique Z&L write about which is a method I’ve tried to use for some time now, but always thought was my own crazy idea that wouldn’t work for others. You might call it The Elephant in the Room. It’s where, as a presenter, if you anticipate or come upon conflict or a proverbial elephant in the room, you actually leverage it to maximum effect. For example, many of us are often in positions where something that seems fantastic, in theory, is not widely embraced by a majority of people because it is seen as just that: nice in theory, “impossible” in practice. According to K&L, by honestly recognizing this type of cognitive dissonance in a group at the beginning of a session, bringing it out into the open, and then suggesting that the goal of your session is to solve this dilemma, you automatically gain credibility because you are, at the very least, not seen as someone with a “party line” or convenient suspension of disbelief. When people are in rapport, say K&L, there is alignment in voice tone, breathing, and actions. Rapport, moreover, is not about agreement, but engagement. To build and sustain it, they say, you must orchestrate effective questioning before and during your session. K&L also recommends using a strategy they call Yellow Light, where, should you have content that may cause discomfort in a group, you warn your group beforehand so that they can be intellectually and emotionally prepared. There are two types of groups, say K&L. Ones with high internal familiarity, and others with low internal familiarity. By knowing whether the members of a group know each other well or not, you have made a sound start to reading your group. Assess engagement and rapport within small groups through body language. If groups trust the presenter, you should notice many eyes looking in their direction when speaking. Should you sense that you are “losing” your group, K&L recommend the previously mentioned strategies of Yellow Light, pregnant pausing, and hand gestures to retain rapport. One mistake we often make in presentations and facilitation, K&L say, is not communicating and/or establishing clear protocols for cognitive and collaborative tasks. Don’t confuse your participants when you’re asking them to do something. Also, when making eye contact with individuals, they recommend one acts again with a clear intention, using it selectively and strategically. Use eye contact for learning conversation, while setting it aside for management moments, as adults do not respond well to being individually managed in a group. When asking questions of, and receiving responses from, the group, K&L recommend standing still, pausing, and following through with probing or paraphrasing. The idea is to honour what people are saying, and to allow speakers to retain ownership of their words, not to take over as a presenter. There are times when, either because of the people or the content you are facilitating, you might come across push-back or outright conflict in the room. We’ve all been in those positions, for instance, where a pointed question is asked which implicitly or overtly disagrees with an important process or idea trying to be delivered. In those situations, K&D say, one should remember never to engage in a back-and-forth with the individual(s). Much like a classroom, they say, it is not really the question that is being assessed by the group, but the manner in which you as a facilitator responds to it. Do you get flustered? Do you pour fuel on the fire? Or do you acknowledge and diffuse the situation through your artful reading of the group? We all have moments where we make mistakes or “lose” our groups when facilitating learning or presenting ideas. The key is not to attempt perfection, but to recover with grace. K&L tell us that “location has memory”. If something negative has occurred in one part of the room, change it up. Take the memory of it away. Presenting, they say, is a dance in the sense that one is trying to create patterns. Therefore, if one pattern is not working, change it up. Breathe and break the pattern. As I stated at the beginning of my post, I just love the idea of deconstructing the techniques that strong presenters and facilitators use to create great adult learning experiences. Choreography helped me reflect on four things in particular with my own work in this area: establishing credibility, breathing, physical movement and location, and the importance of explicitly planning for all of the preceding. Lately, for instance, I’ve been experimenting a little with trying to see how I can use intentional, relaxed breathing to get my groups to feel calm and safe in my sessions, and I noticed that it’s true that you can actually change how people breathe around you. It’s like a Jedi mind trick! Whenever I work with people to support better thinking or practice, I want to think of the process as a science and an art. Hopefully, my groups will feel they’ve been a part of a dance without even knowing there was a floor or music.